Happy New Year! I welcome all our students back to campus and to the onset of the spring semester of the 2018-19 academic year. I hope all students are happily established in their classes and that the semester is starting well for everyone. Senior Capstone Projects. For many senior Political Science majors, this is the time to continue discussions with your academic advisor and relevant POSC professors concerning POSC 396 Senior Capstone Projects. The spring term began on Monday, January 14, and the add date for POSC 396 is Friday, January 25. POSC 396 enrollment requires permission of the instructor, and capstone directors are listed in SIS as individual faculty for each POSC 396 course. Professors available for POSC 396 direction are: Justin Buchler, Karen Beckwith, Matthew Hodgetts, Kathryn Lavelle, Pete Moore, Girma Parris, Paul Schroeder, Laura Tartakoff, and Joseph White. Professors Kelly McMann and Elliot Posner are on sabbatical and are not available for capstone supervision this semester. Only faculty in the Department of Political Science are eligible to serve as capstone directors. Senior capstone prospectuses are due in the POSC department office no later than Friday, January 25. There is very little time in the month of January to begin capstone work, so beginning early is highly recommended. Students can find information about POSC senior capstones on the POSC homepage at http://politicalscience.case.edu/, including the prospectus form, under the Menu link for Student Information. There is also an archive of previous POSC senior capstone titles and supervisors at http://politicalscience.case.edu/senior-project-sages-capstone-archive/, for students who would like to see the kinds of work our POSC majors have undertaken the past and the kind of capstones each faculty member generally supervises. Discussing capstone work with prospective capstone directors. The POSC faculty enjoy directing capstone work, which can be some of the most satisfying teaching we are privileged to experience; hence, we are approachable and we are pleased to discuss capstone plans with any students. The best capstone experiences are shaped by clear agreement between the faculty member and student on the subject and form of the capstone project, and by good communication. Writing only for myself, I think the likelihood of capstone success is increased when the student works with a faculty member with whom he or she has already taken at least one course and where the student’s prior POSC coursework can serve as a foundation for the capstone research. A few faculty members set out their expectations of capstone work on their webpages (e.g. Professor Buchler, Students who wish to write a Senior Capstone with Professor Buchler; Professor Beckwith, Guidelines for POSC 396). Although not all faculty are this explicit in writing, the POSC faculty are always willing to discuss their standards and expectations for capstone work. With a diverse and talented faculty, students have a range of potential capstone directors. I recommend that students discuss their capstone plans with their academic advisors and with a few of our faculty members who work in the research area of the student’s capstone topic. For information about faculty expertise, students are advised to check on SIS to review the courses our faculty offer, as well as to review our faculty webpages. It is a good idea to prepare for such discussions in advance by identifying a few capstone topics for discussion, by matching faculty expertise and interest to the topics, and by considering specific faculty members with whom the student already has a good working relationship. Finally, once a student and a faculty member have agreed to work together, it is helpful to have a discussion about the prospectus, so that it can be submitted to Ms. Jessica Jurcak in Mather House 111 by the January 25 deadline. The Wellman Hill Public Service Internship provides financial support to Political Science majors committed to a summer’s work in public service. I encourage eligible students to review the information about the Wellman Hill competition here, and to discuss the program with their academic advisor and with me, as Acting Director of the Program. Applications, in hard copy, and letters of recommendation, are due no later than Friday, February 8, 2019, by 5:00 pm. Another opportunity for public service is the Cleveland Foundation’s Fellowship Program. This nationally-competitive year-long program is available to college graduates who earned their undergraduate degrees between spring 2017 and spring 2019. Our alumna Olivia Ortega was a Cleveland Foundation Fellow in the inaugural class, and would be pleased to talk with any of our students or eligible alumni interested in applying for the Fellowship Program for 2019-20. I especially encourage our previous Wellman Hill Public Service Internship awardees to consider applying for this Fellowship. Again, welcome back to campus! I wish everyone a happy, successful, and productive spring semester. The Department Office will be closed on Monday, January 21st for MLK Day! Visit our Internships and Careers webpage for updated internship, fellowship, funding, post-graduate, and career information. We need volunteers to help remove flooring, and participate in general demolition. If you are able to donate tools, supplies, food, or anything you would like to give to support our renovation efforts, we sincerely appreciate it! Author, attorney and historian James Robenalt will discuss the roots of the violent uprisings in Cleveland in 1968 and the political aftermath. Co-sponsored by the Kelvin Smith Library and Department of Political Science. Free and open to the community. Join the Girls Invest Founder and other members of their network every Wednesday at 10am to grab a latte and talk finance. The Ellipsis Institute for Women of Color in the Academy invite you to join us for discussion! RSVP by Friday, January 18. Ambassador Ryan Crocker, a statesman whose distinguished diplomatic career spanned four presidencies and who served as U.S. Ambassador in Afghanistan, Iraq, Pakistan, Syria, Kuwait, and Lebanon, will discuss U.S. actions in the Middle East and prospects for peace in the region. Student tickets are $5. 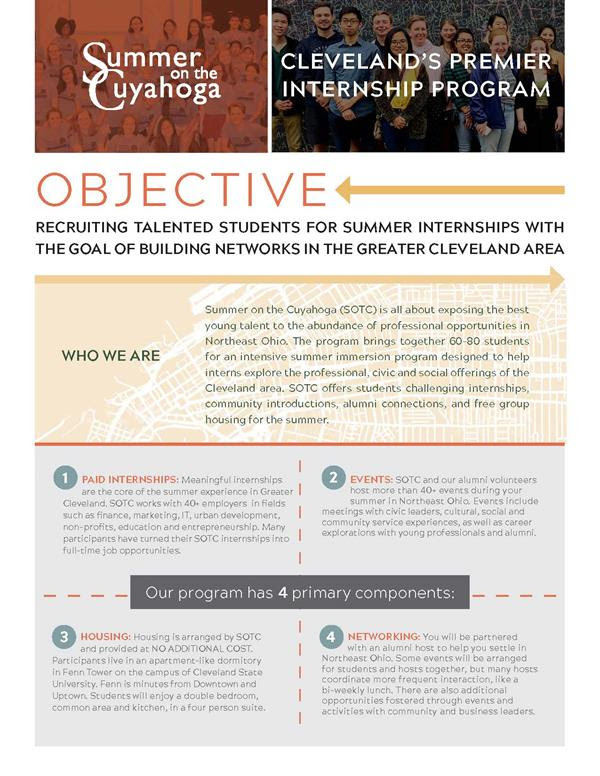 Attend the upcoming Summer on the Cuyahoga information session to learn more about the 45+ employers offering approximately 70 internships here in Cleveland as part of the SOTC program which includes events, activities, and cost-free housing throughout the summer. POLITICO’s EU Studies Fair is the largest educational and networking event in Europe focused on graduate and postgraduate programs in EU studies, international relations, business, economics, public policy and law. Event is free, registration is required. The Center for Civic Engagement & Learning has three exciting student leadership opportunities for the upcoming Spring 2019 semester. Please contact commservice@case.edu with any questions. The program empowers a national community of student leaders to strengthen democracy by leading voter registration, political engagement, and social justice initiatives on their campuses. The CWRU team is currently recruiting for one ambassador position. Apply through CampusGroups. There are a few open spots for this May study abroad course: ECON 350–Urban Economics: The Case of Israel. Contact Economics Professor Dan Shoag for more information. Internships in the Washington, DC and Ohio offices of Senator Rob Portman offer college-aged students an exciting introduction to the U.S. Senate and the workings of a Senate office. Applications for the 2019 Spring Semester are being accepted and reviewed on a rolling basis. Check online for more details on how to apply. Intern with the EYEJ Discussion Series. Contact Abby Jones for more information. Based in Washington, DC, the Design & Digital Team is seeking a full-time or part-time, unpaid intern to assist with graphic design, digital content, and social media. Applications will be considered on a rolling basis, but it is recommended to submit applications early. Spring 2019 DC-based internships are still available. Click here for the available internships and how to apply. Cato’s paid summer internships are for undergraduates, recent graduates, graduate students, law students, and early-career professionals who have a strong commitment to individual liberty, limited government, free markets, and peace—principles that, taken together, constitute libertarianism, known alternately as “classical liberalism,” “market liberalism,” or, to many of our international friends, just “liberalism.” Applications are due February 15, 2019. Internships in the Washington, DC and Ohio offices of Senator Rob Portman offer college-aged students an exciting introduction to the U.S. Senate and the workings of a Senate office. Summer 2019 applications are due on February 15, 2019. Apply online. This four-week summer program offers top global undergraduate and graduate students the opportunity to study at the University of Chicago and gain a foundation in data analytics, policy research and professional development. Session 2 applications are due February 15, 2019. Sophomore and junior students who are interested in carrying out academic research or designing and implementing a project connected to social justice in any discipline are invited to apply for fellowships. Applications are due March 1, 2019. Common Cause has revised and reposted the position for their DC-based Voting & Elections Program Director. They are seeking an attorney who has 3+ years of voting and elections experience. To apply, submit resume, cover letter and salary requirements to Common Cause’s Director of Human Resources. Applicants should apply as soon as possible. Department alumna Hannah Steele (BA POSC ’15) has accepted an offer to study in the University of Illinois at Chicago’s Master of Social Work and Masters of Public Health program. In her graduate work, she will examine the challenges that non-native populations face in accessing mental health services in the U.S. Hannah currently works as a domestic violence advocate for immigrants in Buffalo, New York. Professor of Political Science Juscelino Colares was interviewed for an article in The Washington Times, in which he discussed the impact of two legal cases on trade negotiations between the United States and China. Adjunct Professor Jonathan Entin discussed how Justice Ruth Bader Ginsburg became a pop culture icon on BYU Radio.